Sounds like an oxymoron, doesn't it? Who needs a sweater in the summer? Most of the time we're all melting away in the sun. And while wearing a sweater in 95 degree heat is not what I'm proposing, a light-weight breezy sweater can come in handy sometimes. By wearing a crochet or open weave sweater like I have on here it provides plenty of ventilation and let's the breeze in. I wore this one morning to brunch and was perfectly comfortable in the cool air conditioning. 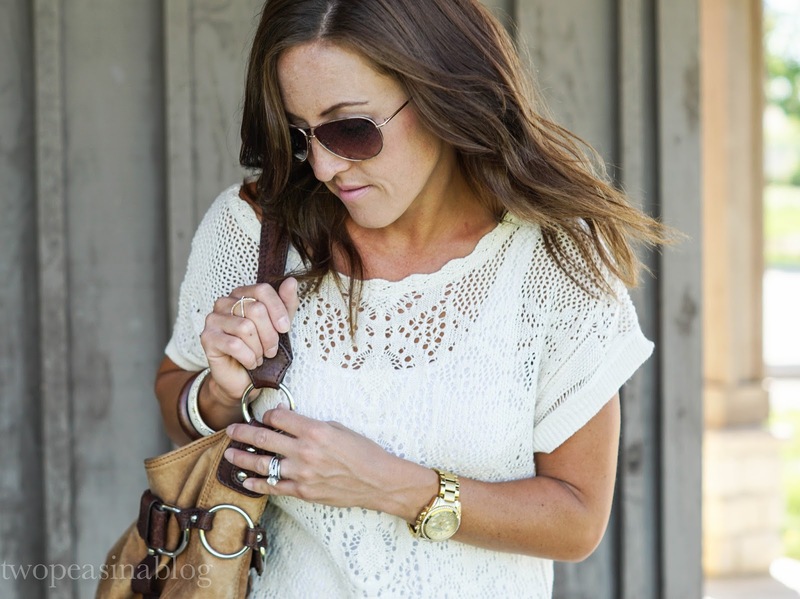 This crochet cold shoulder sweater and this v-neck cold shoulder are great options! Or how about a sleeveless sweater with a pair of shorts? This hi-low sweater tank would be fabulous! I'm crazy about the side slits in this sweater vest! We are planning a trip to Michigan for a little family getaway. With cold evenings up there I'm planning to bring a stripe sweater like this to throw on over a sundress or with my jeans in the evening. What do you think of wearing sweaters in the summer? Tomorrow is the first Tuesday Fashion Party link-up! 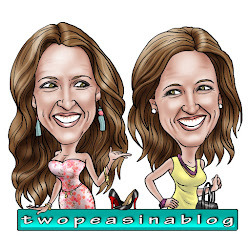 Come link-up your favorite blog posts or find some new fabulous bloggers to follow! This is a cool Summer look - love the fringes!! Thanks Rebecca! I like throwing something a little different into my wardrobe. 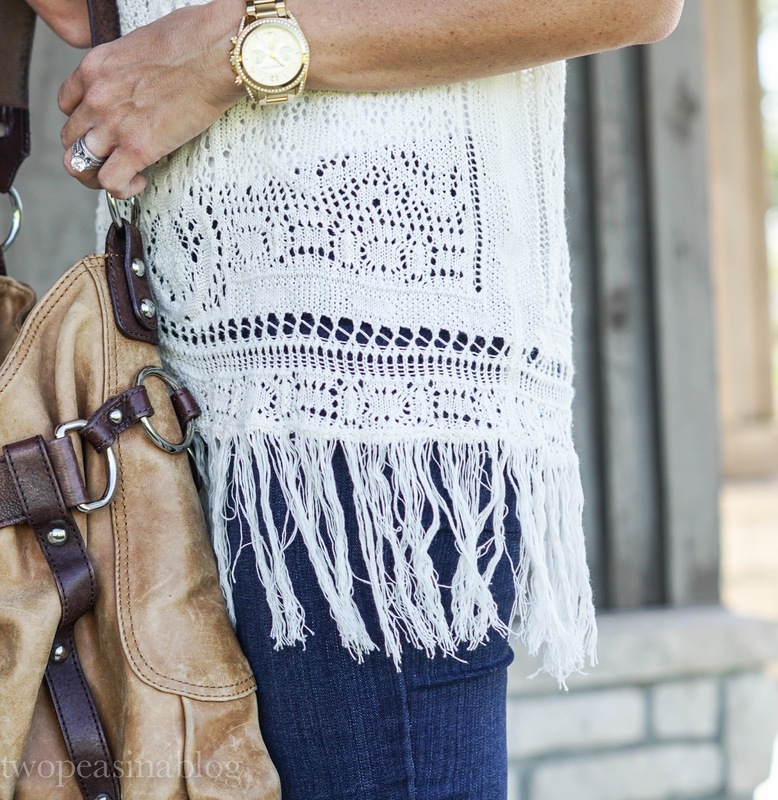 And this crochet and fringe sweater is perfect. Love the fringe detailing here! That sweater is absolutely gorgeous! Thank you Amy! I'm loving it as a summer sweater but also looking forward to layering long sleeves underneath so it can be worn into Fall. You look gorgeous! This summer sweater is so fabulous and I love how you styled it! Thanks Christie! With the fringe and crochet detailing, I'm loving this sweater. This top is so cute, you could totally wear it over a bathing suit. obsessed with the fringe on that sweater!!! Oh my goodness! Me too! Fringe is so fun to wear. I need to get myself more fringe pieces. Thanks so much! I love the crochet detailing. I love sweaters in the summertime. and I am really loving the detailing on this one! Wow, so pretty!! Had to pin this look to my style board!! I'm a Minnesota girl through and through so any excuse to wear sweater-like tops in the summer is a good one. ;) You are gorgeous! !